Kent Wallace began teaching trumpet lessons privately in 1999 and since then has also taught many clinics and workshops in high schools and colleges all over the lower mainland, including the Douglas College jazz intensive and the UBC jazz camp. He also studied jazz performance at Capilano University from 1998-2003. 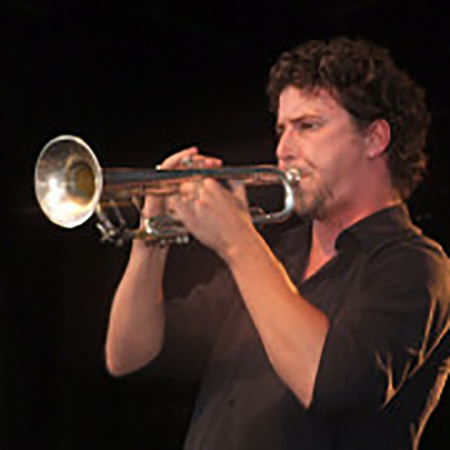 Having been active in the Vancouver jazz scene since 1998, Kent has played lead trumpet and solo trumpet with The Jill Townsend Big Band, VEJI, The Fred Stride Orchestra, The Hard Rubber orchestra, Orchestra Goma Dura and many others, including Powder Blues, Juno nominated Sekoya, and West Coast Music Award winner and Juno nominated Five Alarm Funk. Kent has also backed up artists such as Arturo Sandoval, Colin James, Johnny Mathis, Frankie Valli, Michael Buble, The Temptations, PJ Perry, Ian McDougall, Hugh Fraser, Cedar Walton, Phil Dwyer, Seamus Blake and many others. Kent’s theatre credits include the first Asian tour of 42nd street (2007-2008), High School Musical (2008), A Chorus Line (2009) and the first national tour of Sister Act (2012-2013), covering much of the United States. In 2003 he was the musical director for a production called Let Me Sing at the Surrey Arts Center in Surrey, BC. Kent also recorded trumpet for the 2010 winter Olympics in Vancouver, BC, and performed at the closing ceremonies with Michael Buble.